Our rich culture and heritage is reflected in our food. It is so prominent in our foods and sweet dishes that one an easily identify our culture/ particular place associated with it. 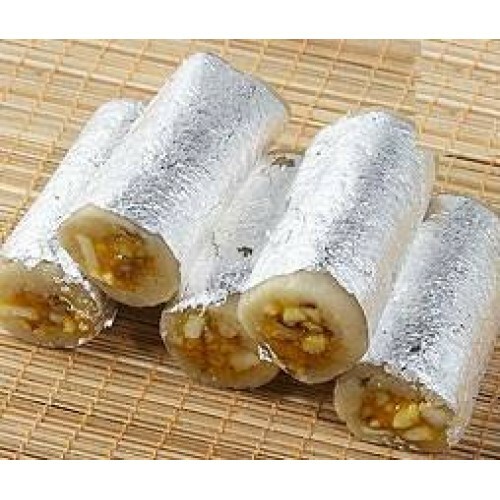 Kaju sweets and kaju Kesar rolls are a popular sweet dish from Rajasthan. Sweets from Kanha if delivery in Jaipur. For other cities, sweets will be from local branded shops. Kaju Kesar is a superb delicacy that is loved by one and all. A mouth-watering Indian delicacy which consists of cashew nuts and saffron is both tasty and smells great too. Moreover, the entire look of the sweet- sweets rolled and the saffron colour- white combination is a feast for the eyes too. Celebrate different festivals with this this amazing delicacy which makes up for a great inclusion in food meant for celebrations. Order this fabulous and yummy Indian delicacy on different festivals and occasions to celebrate the joy and togetherness of the people involved. Delivered merchandise may vary with the images shown above.